Audio For Drinking: Track 10: "I Want You To Know" by Dinosaur Jr.
Track 10: "I Want You To Know" by Dinosaur Jr.
Farm sounds like a vintage Dinosaur Jr album sacrificing nothing despite a two decade lapse and even exceeds their first reunited effort, 2007's Beyond. That album blew away everyone's expectations and brought new life to a band seemingly doomed to be remembered for it's internal strife rather than as one of the most influential underground bands of the late eighties. This is no longer an unlikely reunion, but a revitalization. Where Beyond was a return to early Dinosaur and it's masterful distortion, this album offers a listen into what may have been if Lou Barlow had not left the band and continued into their nineties output. It was then that group finally found the right balance between noise and melody. 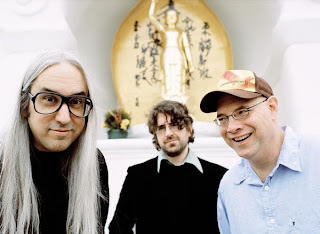 Shredding guitars wait for the right moment to tear away on a solo as Mascis' underrated songwriting carries an emotional weight as wrenching as the feedback. And yes...Farm did have the best cover art of the year. "I Want You To Know" sounds like it was lifted off the classic Where You Been album that brought the band commercial notoriety amidst the alternative boom of the early nineties. The group sometimes jokingly undersold the genesis of their sound being a love of metal and and a discovery of jangly pop. While they in fact listening to a very diverse list of bands, there's no doubting this is awfully catchy for something awfully heavy. 10.) "I Want You To Know" by Dinosaur Jr.